FORT LAUDERDALE, Fla. -- At first there was no hint of distress in the 911 calls, no sense of a crisis unfolding. 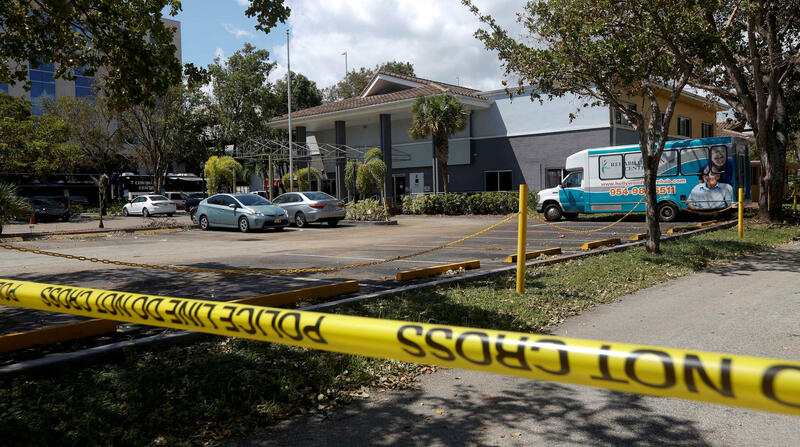 But newly released emergency calls from a sweltering Florida nursing home that lost its air conditioning to Hurricane Irma showed staffers becoming increasing agitated by a disaster that would eventually claim 14 elderly lives. The six calls made from the Rehabilitation Center at Hollywood Hills between 3 a.m. and 6:30 a.m. on Sept. 13, the day the first eight patients died, show that several patients were in respiratory distress and at least two were in cardiac arrest. By the second call, an employee is heard muttering "Whatta night." On the fourth call, another tells someone, "Oh my God, this is crazy." But it wasn't until the final call did one of the 911 dispatchers realize that the sick patient wasn't an individual event but part of a series. The dispatcher, seeing the earlier calls on his computer screen, questioned if this was the same patient. No, the unidentified employee replied, a different one. The dispatcher then asks if additional paramedics are needed. "You guys already have a few other paramedics here, so I'm not sure," the employee responds. The Hollywood, Florida, Police Department released the tapes Monday. The department is conducting a criminal investigation into the deaths but no arrests have been made and no charges filed. After the eight initial deaths, six other patients injured by the heat have since died, the latest two last week. The dead ranged in age from 57 to 99, with most from their 70s to 90s. Investigators have said they want to know why the home's approximately 150 patients were not evacuated to a fully functioning, air-conditioned hospital just across the street until after the first deaths had occurred. Some who died had body temperatures as high as 109.9 degrees Fahrenheit when they arrived at the hospital. The state has suspended the home's license and Gov. Rick Scott has issued an executive order requiring that nursing homes install generators that can power air conditioners. Geoffrey D. Smith, the attorney representing the nursing home, had no comment Monday, saying in a statement he hasn't reviewed the calls yet. CBS Miami reports 911 calls from employees actually began the day after Hurricane Irma hit — Monday September 11 at 6 a.m. Another call came in on Tuesday. And by Wednesday, the staff was in crisis mode. On that day, employees made the six calls to 911 for patients in severe medical distress, including three calls in just 18 minutes. Patients were suffering in the heat, CBS Miami notes. "I'm having respiratory problems with her," a Hollywood Hills employee told 911 on Monday, September 11. The next day, another call to 911, about a 93-year-old patient. "He had a fever, um, we started, you know, like, ordering tests for him and stuff but he's getting short of breath now," another employee told emergency dispatchers. Irma struck South Florida on Sept. 10, knocking out power to most of the region, including the nursing home. The home had generators to power its lights and equipment, but not its air conditioning. The first 911 call came at 3 a.m. on Sept. 13. The unidentified hospital employee tells the dispatcher that an 84-year-old patient is in cardiac arrest. "I saw her slouch over. I noticed she is not breathing," the employee says, adding that the patient's mouth and fingers are turning blue. "We are doing CPR." She then reports that the patient has resumed breathing on her own, but it's "very labored." The second call came an hour later. Again, the patient is near death. At one point the employee mutters, "Whatta night." The dispatcher again sends paramedics. The third call is short. Another patient in full cardiac arrest is receiving CPR. It is about this time that city officials say paramedics realized they might have a crisis developing. The employee who makes the fourth call 30 minutes later is showing stress. She reports nurses are doing CPR on another male patient, sighing, "Oh my God, this is crazy." The employee who makes the fifth call reported that another patient is not breathing. In an annoyed tone, she says to an interrupting co-worker, "Oh my God, I am on the phone." At this point, no one from the home had told the 911 dispatchers, who work for Broward County, about the earlier patients. While the dispatchers are not identified, from their voices it is clear that most if not all of the calls were taken by different people. Only in the final call, coming at 6:30 a.m., did the 911 dispatcher question the employee, asking if this is for a different patient. Yes, he is told. He soon asks if he should send more than just two paramedics. It's then that she tells him there are several already there. About this time, emergency room employees at Memorial Regional Hospital had become concerned by all the patients coming in from across the street. Two employees went to investigate, saying they found patients dying and summoning help. Dozens of doctors, nurses and other employees swarmed across the street, treated the patients and evacuated them to the hospital.